Where Is Donald Trump’s Support Coming From? Donald Trump’s support from Republican voters tends to come from men, seniors and those having a high school education or less, according to results from an online NBC News/SurveyMonkey survey of more than 3,000 GOP primary voters. Trump also has widespread ideological backing from Republicans – as he gets the most support of any candidate from moderate, conservative and very conservative GOP primary voters. Trump is leading in almost every major voting group within the primary electorate, but he is running particularly strong with white evangelicals (20 percent), men (24 percent), seniors (24 percent), and those with a high school education or less (26 percent). He’s also leading with white voters. Twenty-three percent of white Republican voters say they choose Trump as their top pick for 2016, versus 10 percent who support Wisconsin Gov. Scott Walker and nine percent who back Florida Gov. Jeb Bush. The only major demographic group where Trump lags behind is with Hispanic Republicans. Florida Sen. Marco Rubio leads with 19 percent of that group; Bush comes in second, with 14 percent; and Trump is third, with 13 percent. Like most polls have shown, including the NBC News/Wall Street Journal poll, the NBC/SurveyMonkey online survey shows Trump leading among all GOP primary voters at 22 percent. 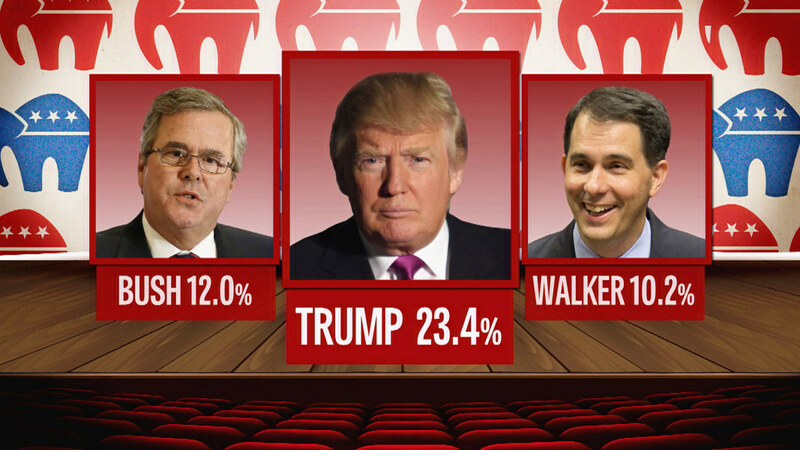 He’s followed by Bush and Walker, who are each tied at 10 percent. Rubio and former neurosurgeon Ben Carson are tied at eight percent; Texas Sen. Ted Cruz and Kentucky Sen. Rand Paul each get six percent; former Arkansas Gov. Mike Huckabee gets five percent; and Ohio Gov. John Kasich and New Jersey Gov. Chris Christie are tied at three percent support. All other candidates are at two percent or less. 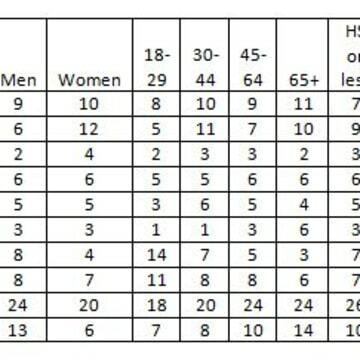 The NBC News Online Survey was conducted online by SurveyMonkey from July 20-26, 2015 among a national sample of 8,228 adults aged 18 and over. Respondents for this non-probability survey were selected from the nearly three million people who take surveys on the SurveyMonkey platform each day. Results have an error estimate of plus or minus 1.6 percentage points for the entire sample, 2.7 percentage points for Republican primary voters and 2.6 percentage points for Democratic primary voters. A full description of our methodology can be found here. The survey was produced by the Analytics Unit of NBC News in conjunction with Penn’s Program on Opinion Research and Election Studies with data collection and tabulation conducted by SurveyMonkey. Analysis by the University of Pennsylvania’s Program on Opinion Research and Election Studies.